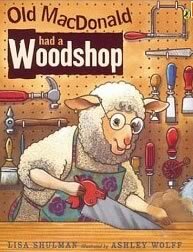 Old MacDonald had a Woodshop by Lisa Shulman and Ashley Wolff is a cute book for toddlers through Kindergarten. From a tool point of view this book shows a lot of woodworking tools along with the names. It shows them in use, and in place in the shop. It also builds on a catchy tune you may have sung with your child a few thousand times but substitutes in tool noises in place of animal sounds. The drawings are great, the tools authentic and many of the tools are old-school so they are generally the kid safer versions they might actually be using in the workshop. The 32 page book is available in hardcover or soft and is listed as an age 4-8 reading level, but my son is just under 2 and loves it. Knows it by heart….and yes, sometimes I hum it to myself when I am in the workshop by myself.